During the American Civil War of the 1860's, it was mostly Democrats that chose to secede from the union and create an uprising against the Republicans led by Abe Lincoln who wanted to abolish slavery. Slavery being the ownership of blacks by whites, or the ownership of another human being by other human beings. 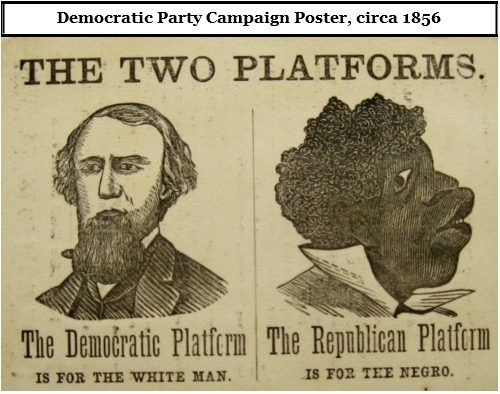 This was and still is the way in which the Democratic Party functions. The Democrats believe in the national ownership of individuals. Not much within the party's platform has changed. Today, it doesn't matter what race or color you are, as long as you belong to the community. And by “belong”, they don't mean by your own voluntary membership, they mean under the orders and control of the community. The Democrats and their devout opposition to private gun ownership, private healthcare, private social security, and individual independence fits perfectly into the complete storyline of their history. The Democratic Party is the country's oldest political party. Not all Americans cared much for the party's values. Between 1860 and 1932, the Democrats only elected two presidents to office. One of the key figures in the establishment of the Democratic Party was a man named Martin Van Buren. In 1837 he was elected president – after Andrew Jackson. It is said that Van Buren believed slavery was morally wrong, but his policies as president never really reflected his supposed belief and the country's policies on slavery never changed. In 1840, Van Buren's proposition to create an independent treasury system passed and the U.S. Treasury took over the nation's funds and created a clause requiring all payments to be made in coins and hard money. This became a small step in further controlling how American's would earn and spend their money. With raging unemployment and national debt, Van Buren became more and more unpopular with the American public until he finally left The White House in the midst of a five-year economic depression. By 1841, Van Buren was gone and American's had a bitter taste in their mouths. The Democrats were always in favor of expansion and never cared at who's expense it would come. After 1846, the Democrats acquired large amounts of land in the West through the removal, murder, and expulsion of American Indians. The Democrat's next elected president, James Polk, was a slave owner. After becoming president in 1845, Polk purchased more slaves. Under his presidency, American Indians were attacked and murdered, causing several acts of retaliation and backlash, which only led to stronger responses against American Indian tribes from the Polk Administration. One of these acts of retaliation was the infamous Whitman Massacre, which resulted from American Indians believing that several of their people were being poisoned and exterminated by Dr. Marcus Whitman and other Americans. The massacre of Whitman and his wife became an excuse for Oregon to wage the Cayuse War against the Cayuse people of the Northwest. The U.S. Army eventually offered its support. In 1855, after suffering massive casualties and defeats, the Cayuse people ceded most of their land to the United States. The ownership of Oregon was still under negotiation with the British during the Cayuse War and it had only a provisional government at the time. One of Polk's objectives was to eventually acquire the state in full. James Polk was an expansionist and subscribed to Manifest Destiny. The Democrat's chief opponents at the time – The Whigs – opposed Manifest Destiny, which promoted the unmitigated expansion of the United States. Between 1860 and 1930, the only way Democrats could beat Republicans was by running more Republican-like candidates like Grover Cleveland, who was a supporter of laissez-faire capitalism, the gold standard, and private banking. He also opposed American expansionism. All of these positions made Cleveland a polarizing figure in his own party. Cleveland was the only president to serve two non-consecutive terms in office. Like all other Democratic incumbents, though, Cleveland's second term was marred by yet another economic depression which he failed to prevent or fix, and in 1894 the Republicans won another landslide. It was during the Great Depression that Democrats saw an opportunity to take their party back to its old roots of deprivation, theft, and oppression. With the election of Franklin D. Roosevelt in 1932, America was set on a new course of high (“progressive”) taxes, wealth redistribution, and strict business regulations. This was all done in the name of preventing another depression, which the Democrats held the Republicans accountable for. Several Democrats argued against monopolies, corporations, businesses and deregulation, claiming that big business was the cause of a vast majority of the nation's ills. With their bickering and ranting came The New Deal, one of the most economically oppressive reforms in modern U.S. history. The U.S. economy saw brief growth until it weakened again by 1937, leading most Americans to question how successful the new plan really was. The ideas within the The New Deal stuck, despite their weak results, and they gave birth to a future of regulations, complex social programs, and powerful labor unions. America's new future had been written by Democrats, and their policies would shatter America's traditional concepts of personal liberty for decades to come. The Democrat's most murderous president took office after the death of Franklin Roosevelt in 1945. Harry Truman became president after serving as Roosevelt's vice president and within the very same week was briefed on the Manhattan Project and its successful Trinity test. Although the Japanese had instigated a war with the U.S. and killed thousands of Americans in their attack on Pearl Harbor, the result was still more devastating for Japan. On August 6th, 1945, Truman ordered the nuclear annihilation of Hiroshima, killing upward of 130,000 innocent Japanese civilians. On August 8th, Truman ordered the nuclear annihilation of Nagasaki, killing upward of 80,000 innocent Japanese civilians. From the comfort of the Oval Office, Harry Truman was able to order the death of 210,000 innocent people and restart America's imperialist agenda (the one conceived and supported by earlier Democrats like James Polk) and exhibit America's new strength to a fearful world. After World War II the imperialist agenda seemed to become a permanent staple in the foreign policy of both the Democratic and Republican parties. The politics of America had been permanently realigned by two corrupt, imperialistic and statist presidents. After Truman, Republican Dwight D. Eisenhower took office and used America's new status as a nuclear power to deter dictators and threaten other nations. He never used nuclear weaponry and instead proposed re-budgeting to fund less expensive and less destructive nuclear alternatives. It was Dwight D. Eisenhower who warned American's in his farewell speech about a new Military-Industrial Complex and how it posed a threat to the American way of life. By the 1960s, Democrats had long done away with their race-based control systems and come to the realization that it would benefit their party to enslave everyone equally under systems of regulation, fear-mongering, and government dependency. Since the Truman era, Democrats have promoted themselves as a progressive party that seeks to eliminate racism and income inequality by advancing basic human rights. The Democrat controlled Congress of 1977 passed the Community Reinvestment Act, which encouraged banks to lend to low income borrowers in an attempt to create more equality and less discrimination. In 1996, the Department Of Housing And Urban development (HUD) under the Democratic Clinton Administration, helped provoke Fannie May into lending at least 42% of their mortgages to low income borrowers. One year prior, in 1995, Fannie Mae and other companies like it were given government incentives to purchase mortgage backed securities and loans that were granted to low income borrowers. This was all a part of a Democratic plan to allow low income families to own homes and prosper the same as mid to high income earners. It was all a part of the Democrat's continuing equality plan. Just over a decade later, after the efforts of the Democrats and Bill Clinton, several low income earners could no longer afford their mortgages. Fannie Mae and Freddie Mac had now owned billions worth of toxic assets. That combined with sub-prime lending and other factors eventually resulted in one of the worst economic meltdowns in recent U.S. history. Of course, the outgoing Republican president took the whole bullet for the crisis in 2008. In 2009, the Democrats took back The White House to create four more years worth of “progress”. This progress included more regulation and the expansion of the Federal Reserve's powers. It also included the first ever healthcare mandate designed to force all individuals, rich or poor, to purchase health insurance – whether they could afford it or not. The country's poor and low income earners were now destined to become poorer so already insured mid and high income earners could eventually have lower healthcare premiums. At the end of the day, the poor will have incurred a new expense that they couldn't afford, but one that mid and high income earners already had. Although accidents and medical emergencies can be costly for the uninsured, forcing them to buy private insurance won't fix the problems of American healthcare. A vast percentage of Americans who can't afford insurance also don't use or need many healthcare services and facilities – minus the occasional accident or emergency. Looking forward, only a minority of low income Americans will actually be better off by being forced to purchase health insurance. The majority will only get poorer. The ways in which the Democratic Party – and Obama alone – have corrupted the United States Of America are staggering. The ways in which their ideas have penetrated all levels of government, and even the Republican Party, are tremendous. As much as Democrats would like to blame Republicans for imperialism and expansionism, the Democrats were the ones who transformed America from a mind-your-own-business nation into a mind-everyone's-business nation. At times when Democrats were busy intervening in the lives of citizens and into the affairs of other nations, Republicans were the ones who stood forward as protectors and heroes to the people. Unfortunately, those times seem to have ended. From the adventurism of two Bush Administrations and the excuses to suppress freedom brought by the threat of terrorism, an important question arises. Can we bring the old Republicans back and put an end to the intrusive and oppressive legacy of the Democratic Party?